Welcome to part two of a three part blog, which aims to provide a technical overview of StorMagic SvSAN. Part one of the blog provided a brief overview of SvSAN and outlined how you can decide whether hyperconverged infrastructure or server SAN is right for you. This part will explore SvSAN in more depth, and part three will define options for deployment models. StorMagic SvSAN is a software-defined storage solution designed to run on commodity x86 servers, with two servers being the minimum cluster size to provide high availability. It is specifically designed with lightweight system requirements in order to deliver highly available, shared storage with centralized management. Eliminating the need for physical SANs, SvSAN is simple,cost effective and flexible. There are a variety of ways in which it can be deployed, including a typical hyperconverged configuration or a storage-only cluster (also known as a server SAN). SvSAN supports the industry-leading hypervisors, VMware vSphere and Microsoft Hyper-V and can utilize any commodity x86 servers and is installed as a Virtual Storage Appliance (VSA) requiring minimal server resources to provide the shared storage necessary to enable the advanced hypervisor features such as High Availability/Failover Cluster, vMotion/Live Migration and VMware Distributed Resource Scheduler (DRS)/Dynamic Optimization. 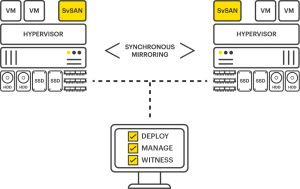 SvSAN can be deployed as a single server, simple 2-node cluster, or multi-node cluster, with the flexibility to meet changing capacity and performance needs. This is achieved by adding additional capacity to existing servers or by growing the SvSAN cluster, without impacting service availability.